Here’s a side view of the proposed aquatic turtle habitat design and a rough idea of how things will work when they are all put in place. I’m contempating whether or not to attach a submersible pump to the reverse stand pipe that pulls water from the overflow reservoir and push it to the sump. The alternative is to rely on gravity and have it syphoned to the sump. 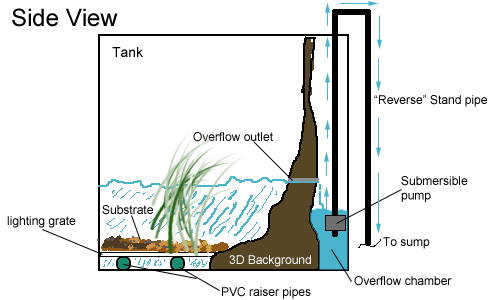 Of course the other alternative is to opt for a traditional design for the overflow reservoir; that is drill a hole at the bottom of the tank, secure a bulkhead and attach a stand pipe to it. Water will flow down to the sump after it reaches the height of the stand pipe. Only thing about that is I don’t think I want to drill a hole on a glass tank. Next up is to design the wet / dry sump and refugium setup.